They are built on a vertical slant with rolling tracks that make for efficient movement of the products once they are on the rack, needing nothing more than gravity. Flow racks are often utilized by distribution centers and manufacturing plants. Flow Racks – Ridg-U-Rak®, Inc.
Carton flow racks are a live storage system in which cartons are deposited on one side and are driven by gravity to gently flow to the other side. A type of flow rack relying on gravity and specifically designed for the storage of cartons, carton racks provide high-density, dynamic storage for medium or slowing moving SKUs. Unlike a static storage system that requires much reaching, bending and pulling on the part of the laborer to reposition and restock, a carton flow rack system provides an easy-access, ergonomic way for product to always flow to the front position, a property that is implemented in many types of warehouse racking. Using carton flow racks cuts labor costs by reducing the amount of required pickers by half or more as well as floor space since fewer aisles will be needed to store the same amount of cartons. Both the backside and the front of carton flow racks are used for storage making them highly useful for high-density storage. As highly-efficient storage rack systems, carton flow racks serve industries such as warehouses, industrial, commercial, distribution, wholesale grocery, electronics, cosmetics, automotive and medical. Typical applications for carton flow racks include storage, material handling, picking, inventory rotation, assembly lines, wash-down and other applications that require the FIFO, or first-in first-out, method of handling inventory. Similar to conveyors, carton flow racks are loaded on one side by either a worker or, more commonly, a forklift and the carton is then driven by gravity to flow down a framed roller track until it reaches a stopper at the other side of the rack. 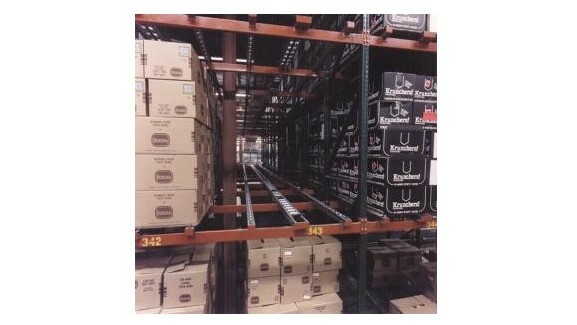 Rolling racks will typically have lanes in which similar cartons are kept separate by means of shelf guides. Consisting of many individual components, carton flow racks are modular and therefore allow for flexibility and variety of use. By using “starter” and “adder” sections, rows of carton flow racks can be developed by stringing together different units that befit the specific application. Carton flow racks have two distinct frame styles: square front and layback. Square front carton flow racks are vertical frames with straight shelving and are advantageous for picking full cartons. Layback carton flow racks are vertical frames with diagonal shelving and are beneficial for picking from open cartons. There are also several types of shelving for carton flow racks: straight shelves, knuckled shelves, weld-in trays and reverse knuckled shelves. Straight shelves are the most common type of carton flow rack shelving. Knuckled shelves are the next most common type and are beneficial when it comes to picking individual items out of cartons. Weld-in trays are very similar to knuckled shelves; however they provide a much larger access space for picking. Reverse knuckled shelves are beneficial for split case picking applications in which the items are picked out of the carton’s front. Flow Racks Flow racks are specialized storage racks used to quickly move packaged products through a warehouse.